Baltimore City State's Attorney Marilyn Mosby holds a news conference on July 27, 2016, at Mount and Presbury streets, the corner where Freddie Gray was taken into police custody, after dropping the charges against the three remaining officers to be tried in his death. At left is Gray's stepfather, Richard Shipley. In a controversial move, Baltimore City State's Attorney Marilyn J. Mosby dropped charges against Police Officer Garrett Miller, Police Sgt. Alicia White and Police Officer William Porter, the three remaining Baltimore officers accused in the arrest and death of 25-year-old Freddie Gray. The timing of the dismissals was surprising to medical professionals, lawyers and laymen alike who had theorized that Miller, the arresting officer and the next officer scheduled to stand trial, was the most likely to have caused Freddie Gray's injuries. As the trial for Miller was set to begin Wednesday, with a motion hearing regarding his immunity, the state dismissed his case. Flanked by her prosecutors and Gray's parents, Mosby gave a press conference in Baltimore's Sandtown-Winchester section in front of the Gilmor Homes, a mural of Freddie Gray behind her, as she discussed the obstruction she faced from the Baltimore Police Department. Mosby spoke sharply about individual Baltimore police officers she felt failed to cooperate: "We realized very early on that police investigating police, whether they were friends or colleagues, was problematic." She went on to cite officers who she alleged acted as hostile witnesses and police investigators who were "uncooperative and started a counterinvestigation to disprove the state's case." Mosby also issued broader indictments of a corrupt and crumbling system that's in desperate need of reform. "After much thought and prayer it has become clear to me, that without being able to work with an independent and investigative agency from the very start, without having a say in the election about whether our case proceeds before a judge or a jury, without communal oversight of policing in this community and without real substantive reforms to current criminal justice, we could try this case a hundred times, and cases just like it, and still end up with the same result," she said to cheers. After Mosby spoke, Gray's stepfather, Richard Shipley, stood beside Gray's mother, Gloria Darden. Darden was being encouraged by neighbor Gwen Taylor, who has lived in the neighborhood all of her life. "He did not die in vain, and God will always be with you all," Taylor said gently as she looked at both Darden and Shipley. "I pray that our city will stay quiet and we understand that things will not always go our way," Taylor continued. "We will look to the Father. God will take care of all of them." "We were very pleased with Marilyn and all of her actions and her prosecutors, and we will stand by her," Shipley told The Root. "We were disappointed with the outcome of our trials. We are going to see that new legislation is carried out and new laws will be made that will help the community and help other black communities. These laws will be made because of Freddie." On the other side of town at the Fraternal Order of Police headquarters in the city's Hampden section on Buena Vista Avenue, the six police officers charged in the death of Freddie Gray were flanked by their lawyers, standing behind a podium. Gene Ryan, the head of the FOP, addressed the crowd. "We are pleased that the criminal charges have been dismissed, justice has been done," said Ryan inside headquarters. "We will continue to support our officers during their administrative hearings and believe these good officers will be returned to fulfilling their duties with the Baltimore City Police Department," he told a small crowd of reporters. Neither Mosby nor the police officers were able to take questions. The officers are undergoing an administrative internal review during which they will be investigated by the Montgomery County and Howard County police departments of Maryland. And the officers have sued Mosby in a civil lawsuit alleging defamation and false arrest. So How Did the Case Come Undone? There are many who believe the problem started before the trials even began, with the medical examiner, Carol Allan, and her determination that Gray's injury occurred in the police van at the fourth stop the officers made along the route to Central Booking. This was a key part of the case, which forced prosecutors to prove criminal negligence in terms of a rough ride or failing to secure Gray in a seat belt, rather than focusing the case around whether Gray was injured before he entered the van and whether other officers were culpable in terms of causing further injuries. "When they were taking him into the van, he was dragging his leg and it looked very much like they [his legs] were weak. It's empiric evidence, but it's quite likely that he had some spinal injury prior to being loaded into the van. If someone put their foot on his neck, that could cause partial or complete paralysis," said Alexander G. Reeves, a retired neurologist. "The video taken by Kevin Moore that shows police getting off of him, lifting him off the ground and hoisting him on his shoulders. His legs look plastic, the way his feet are splayed out," said Alan Meyers, professor of pediatrics at Boston University School of Medicine. "There doesn't seem to be any muscle tone in his legs, and they're dragging him. It takes some force to break someone's neck, they would know. If he has a knee on the back of his neck, sure, it could break it. This is speculation. The only thing that isn't speculation is that it appears in the video that his legs are flaccid." Moore, who after Gray's death began volunteering for a group called Copwatch, which films police arrests—the group that filmed Alton Sterling's recent killing by police in Louisiana—believed the same but was baffled by the fact that he was never called as a witness. He told The Guardian that Gray was thrown to the ground and put in a position where he was "hog-tied" with the officer's knee in his back. "One of the witnesses present, though blind, spoke on television about Gray screaming about neck pain," said Dr. Mary Anne Whelan, a neurologist with degrees from Radcliffe, Harvard and Dartmouth who closely watched the case. "Witnesses present refer to his leg disuse and to the police folding him up like an origami." Whelan asserts that there's no question that Gray's neck was broken during the takedown; his complaint of having trouble breathing, she says, is consistent with rapidly evolving diaphragmatic paralysis, and the audible noise heard in the van likely wasn't caused by Gray kicking but was more likely the result of a seizure or of his unsecured body rolling about in the van. 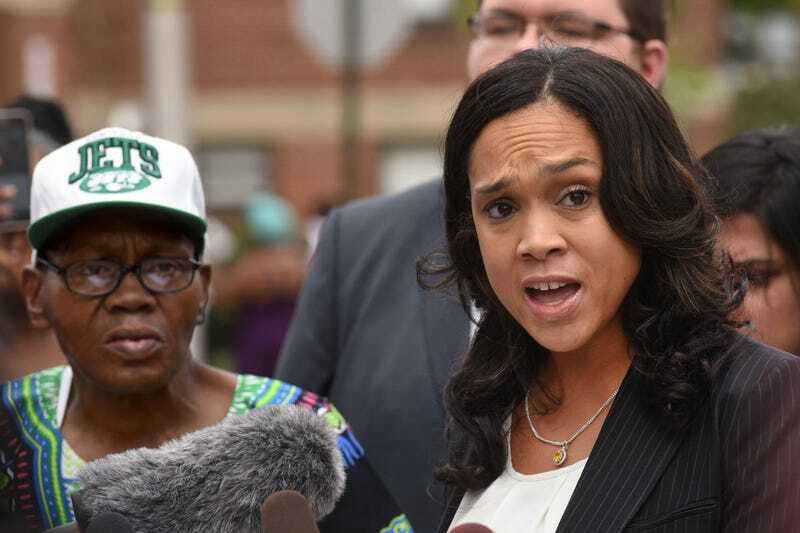 "Mosby took her charges from the assertion from the M.E. that it happened in the van, and that's not based on evidence that's in her purview as a medical examiner," Whelan said, adding that the prosecution was inept. "It seems to me that has distorted the whole thing." During the press conference, Mosby complained of police who were hostile witnesses and had to be compelled to testify. The van driver, Police Officer Caesar Goodson Jr., never testified or gave a statement to police investigators. Despite the public trial, much of the public still doesn't know exactly what happened to Gray other than that he went into a police van alive and came out with a crushed voice box and a severed spine. "Yeah, they did," Gray's mother told The Root when asked whether she thought police injured him before he got in the van. "They lied and I know they lied. I know they killed him."